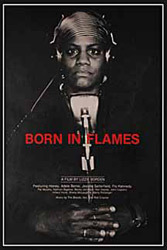 You wouldn't necessarily think an independent, militant lesbian sci fi drama with spoken word poetry would in any way be a watchable, let alone an enjoyable cinematic experience, but the vibrant Born in Flames defied my expectations. Director Lizzie Borden tackles racism, sexism, and intelligent political theories in this, one of her few films that features a young Kathryn Bigelow (of Point Break directorial fame and heartthrob of my husband's) who's a bit awkward on screen, but most of the cast of quite beautiful and strong women are surprisingly natural as far as independent cinema goes (and we all know how it can go). The plot is simple yet complex in terms of its ideas about socialist democracies and women armies. There's been a peaceful second American revolution, yet minorities and women are still disenfranchised and begin to take to the airwaves and streets to bring the system down. What it lacks in solid story structure it more than makes up for in dynamic energy. It features some great music, memorable imagery, and a devoted cult following – and it's available instantly through Netflix.